About the Wine: Behind Alara Cellars was the inspiration to bring two things that owner and winemaker, Janu Goelz, loves together: wine and fashion. Previous to her winemaking career, she had a clothing line in San Francisco. Since then, her career has taken her into quite a few different directions and has landed her in the world of wine. 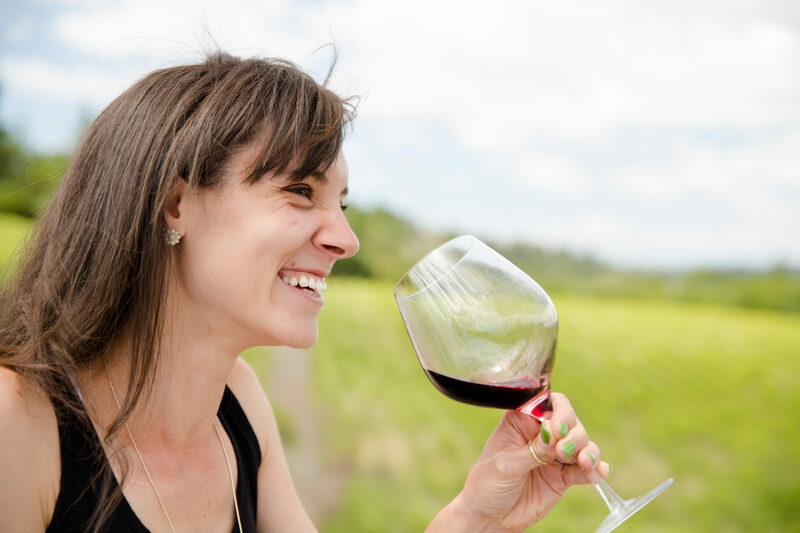 Alara Cellars is her way of staying connected with her passion for fashion, while making/drinking wine. Janu collaborates with fashion designer Malene Grotrian out of Vancouver, British Columbia. She tells Grotrian what she thinks the wines would look like if they were dresses and Malene interprets the description and paints them. Each wine and each vintage have different original and custom paintings done for them. The Alara Cellars 2017 Grenache Blanc is made from 100% Grenache Blanc grapes harvested from San Benito, California. Flavor Profile: Open the bottle of the Alara Cellars 2017 Grenache Blanc and find pretty aromas of apple, apple blossom, and honey suckle. The look of this Grenache Blanc is near clear on the pour, but in the glass it’s a confident blonde caramel hue. Initial aromas are quite floral: lilies, chamomile, jasmine. Swirl and find soft hints of stone fruit, like white nectarine. Lift the nose away to find an earthy aroma reminiscent of dewy grass warming in the morning sun, just slightly sun-kissed fronds from those early summer days. The palate of the Alara Cellars 2017 Grenache Blanc is soft, with just a slight effervescence. The acidity is delicate at first, then amplifies toward an explosive finish. There’s just a slight texture, a thin, but solid backbone that gives this light white wine structure. NOTE: I started the Grenache Blanc slightly chilled (around 55°F) and let it come up to room temperature through the course of the evening. Initial flavors, though floral-forward, portrayed fruits as well: grapefruit and lime zest, lemon pith, peach and nectarine skin. There’s also a ocean-sandy-beachy, almost salty umami lingering in the background. The aftertaste is all about vanilla and oak. As the wine came to temperature, those floral notes absolutely took over and, at one point, I said “It’s like drinking a glass of white flowers.” This, to me, is a major compliment. (The first wine I ever fell in love with tasted completely of flowers.) Don’t get me wrong, it’s not like eating soap or perfume, the floral note maintain a delicacy, the minerality keeps it in check, the texture maintains structure, and those fruits, though in the background, maintain their acidity and break everything up quite evenly. Food Pairing: I paired the Alara Cellars 2017 Grenache Blanc with a plank-baked mahi mahi that was marinated in a homemade ginger-miso glaze. This was served on top of coconut rice and topped with shredded cabbage that was dressed in a slightly spicy peanut sauce. This meal made the wine absolutely gluggable. The peanut sauce which was, again, mildly spicy, made the acidity explode in the mouth even more on the finish (in a good way). But with its innate creamy texture, it also somehow called out those beautiful florals further, as well as some of the softer, stone fruit notes. The coconut rice complemented the texture of the wine, while the wine, in turn, pulled out the coconut flavor out of the rice. And the fish somehow highlighted that beachy-dusty-earthiness. I chose this food and wine pairing before even looking up what Janu had to say about her wine or even reading the back of the label. (Which I just now realize, I still haven’t…). Anyway, she writes on her website “Pair this wine with a spicy Thai crab drenched in a coconut milk sauce.” So if you don’t believe me, believe the winemaker. More Info: I received the Alara Cellars 2017 Grenache Blanc as a gift. (Cheers, Mary!) Price: $37. For more information about Janu, her wines, and to purchase wine directly, please visit the Alara Cellars website.